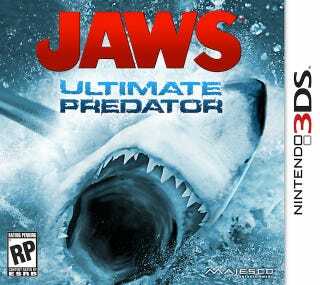 This fall's Jaws: Ultimate Predator will be released on the Wii and 3DS and, in it, you'll play as a shark. No surprise there. That's how it worked in 2007's Jaws Unleashed. As the shark you chew boats and people. You'll rip off limbs, but only on the 3DS version of Ultimate Predator. Like the Unleashed games, the 3DS version of the new Jaws is expected to get an M rating. The Wii version, which won't have the limb removal, according to a representative from the game's publisher, Majesco, who showed me the 3DS build at E3, will be rated T.
M-rated portable games are still a relative rarity. But what's more striking here is that the 3DS is seen as a platform that is more suited to an edgy experience for the Wii. That T-rating for Jaws on the Wii conforms to the predominant view of the Wii, fairly or not, as a console for kids and other people who are gentle at heart. It is a welcome, minor surprise that the same company that appears to hold that view for the Wii views its 3DS customers as more accepting of something with sharper teeth.